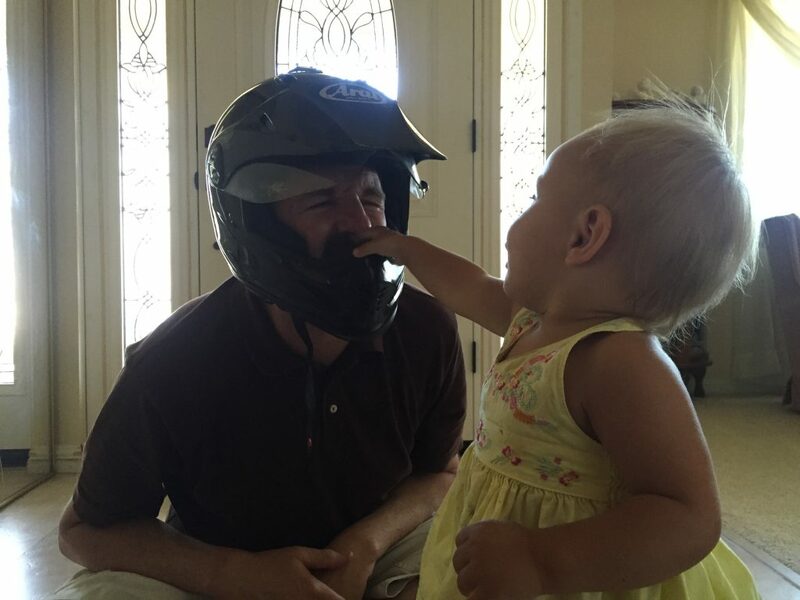 In July I went on my first big motorcycle trip heading to Sacramento, California for our granddaughter’s first birthday! This was my first multi day trip and boy did I learn a lot. On our first day we got a late start leaving the house after 3. 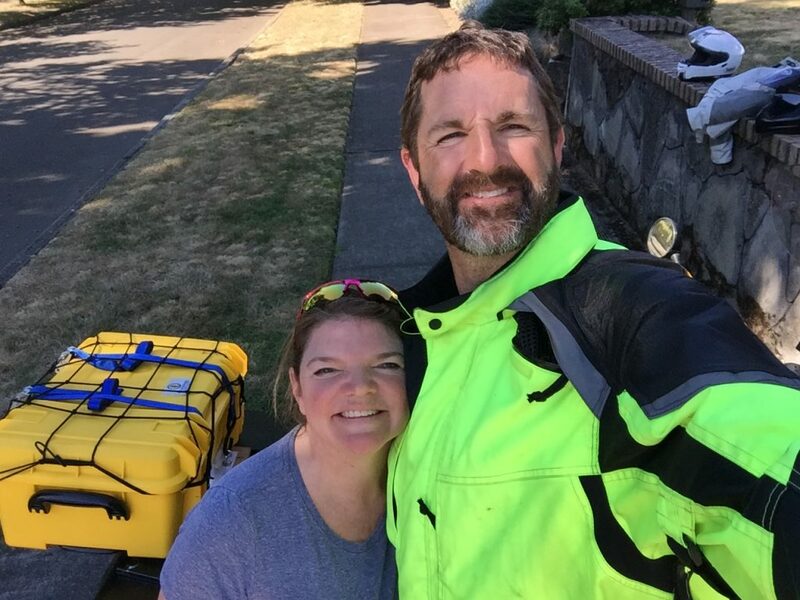 We packed up our suitcase and the two side cases on the bike to head west for the Oregon coast. Our first stop was in Tilamook, Oregon at the Rodeo Steak House. It was a good meal to kick off the trip with! We enjoyed a couple of burgers to fuel our bellies for the road. We headed south down the coast and enjoyed lovely green farms and the ocean view of course! Our next stop was the Devil’s Punchbowl State Park we enjoyed checking out the large rocks shaped like a bowl, the ocean view, and the beautiful sunshine. Riding along the coast was beautiful during sunset but I sure was glad I had my gear on to keep me warm! We didn’t really have specific plans on where we were going to stay for the night and ended up stopping in Coos Bay at the Mill Casino & Hotel for the night. Hot tub here we come! Another late day for us due to some unforeseen errands we needed to take care of before we headed south. I did a lot of hanging out in front of the Staples store. Our goal Eureka! Since we left late in the day it got cold and dark. 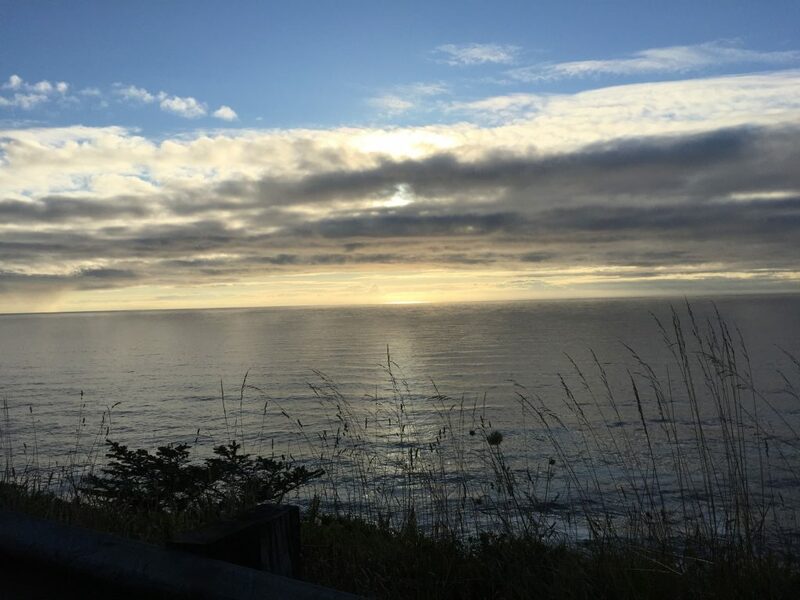 We got to see some of the beautiful Oregon Coast but not much. Still very thankful for my motorcycle gear, it keeps warm and dry! We stopped off in a small town on the way for dinner and we were lucky enough that the restaurant stayed open to feed us! I wished I could remember the name of the restaurant and the town. We arrived in Eureka, California somewhere around 10pm tired and ready for the hot tub! We stayed the night at a Best Western in town, enjoyed the hot tub, and got a good nights sleep. We woke up and went to this great coffee shop in town called Black Lightening Motorcycle Cafe. We enjoyed some good food, the motorcycle memorabilia, and the old town feel of Eureka. We had no idea how cute it was and plan on going back some day! 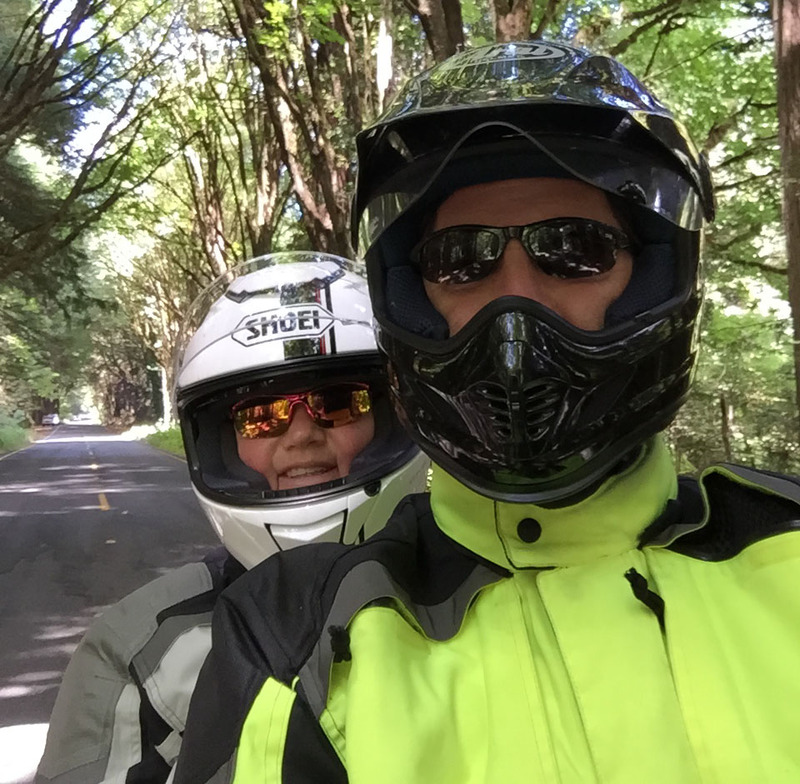 We headed south and enjoyed riding through the Avenue of the Giants, beautiful redwood trees. We stopped off at The Peg House Grill for lunch and enjoyed the food, the funky general store, and taking a break from being on the bike. We saw some interesting things at Peg’s! 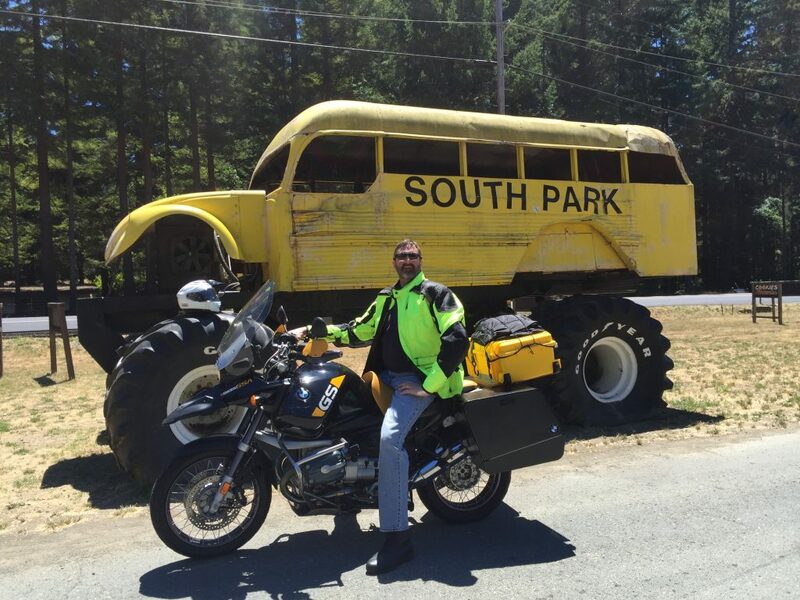 Check out the souped up bus called the “South Park”! We rode past Clear Lake which was very tempting since it was a hot day to just stop off and go for a swim. Even though the lake looked tempting we kept moving along. We stopped at a fruit stand on the side of the road and took a break. 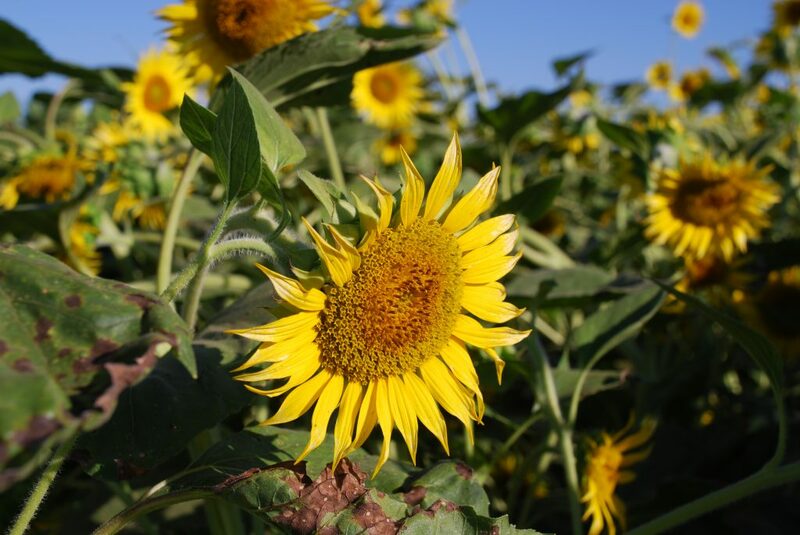 Across the way was this beautiful field of sunflowers, my favorite. During our break we took the time to enjoy them up close. On road trips you will see the craziest things sometimes. At a gas station in Williams, California we saw a bunch of metal sculptures on display! I am not sure who would by a gigantic multicolored dinosaur but if you are looking for one it’s in Williams, California! Finally we made it to Sacramento! 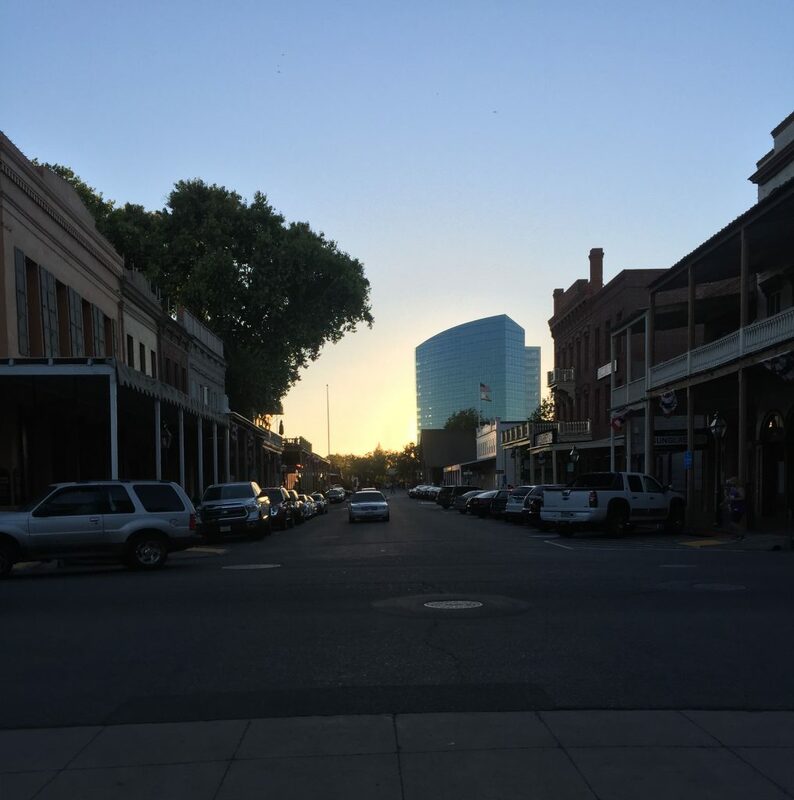 We hit Old Town Sacramento and enjoyed the quaint historic buildings and found a restaurant for dinner. Our weary bones were ready to rest! I knew my big motorcycle trip was going to be a challenge but you never know exactly what you are in for until you are actually doing it. We found a hotel to stay at and soaked in the hot tub and went to bed! 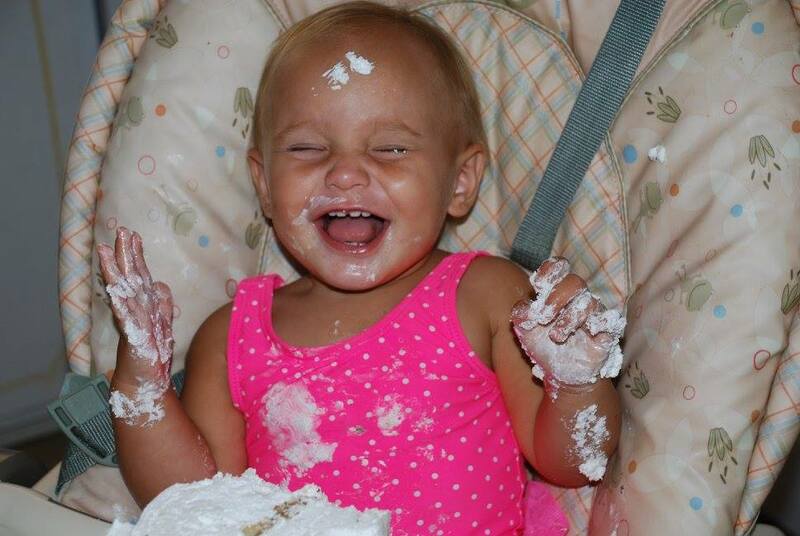 Our granddaughter’s birthday was on day four! We spent the day with our daughter Ariel and granddaughter Ava celebrating her first birthday! It was fun day for all! It was extremely hot in Sacramento and we wanted to visit friends in Truckee, California so we decided to pack up for a couple of days and head for the Sierras! We had breakfast at Carol’s restaurant with Ariel and Ava and then headed east! It was beautiful ride once we got out of the heat! Our first stop was Rainbow Bridge and the view of Donner Lake. We had a late lunch at Jax At The Trax. It’s always a great place to get a filling meal. We enjoyed seeing our favorite waitress Lola and eating good food! After we ate we headed to our friend’s house to relax. We were very thankful Lana Sue had a guest room for us! We got to visit and enjoy the wonderful smells of the forest! 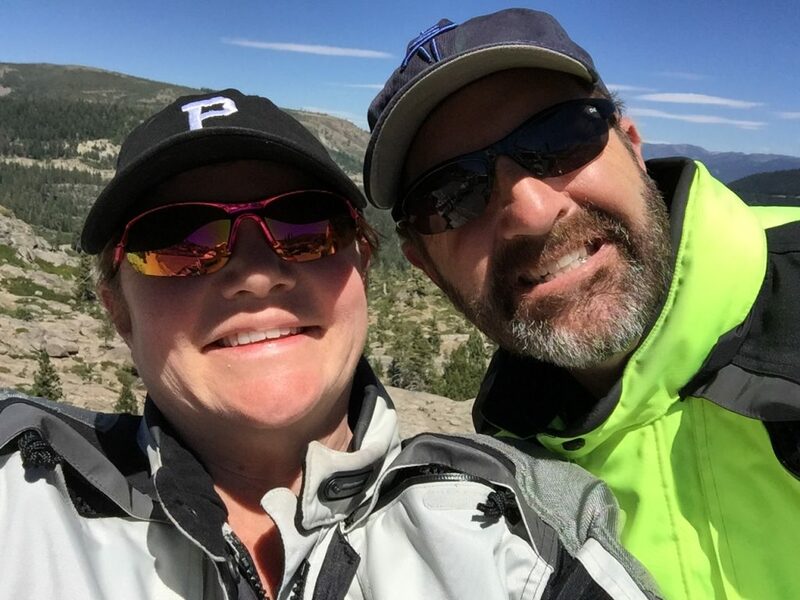 We visited with friends, enjoyed eating at the local restaurants, and we rode down to North Lake Tahoe. 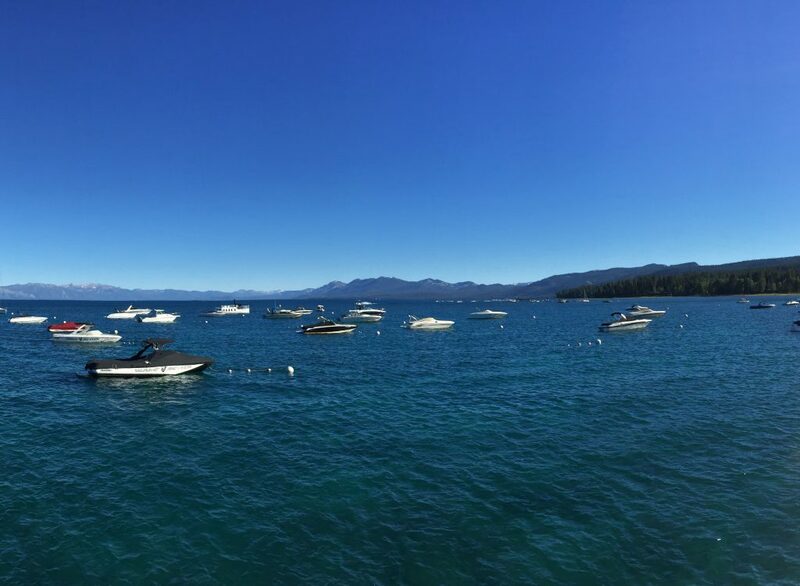 We stopped off in Tahoe City to enjoy the view of the lake and walk down memory lane at Commons Beach. Commons Beach is the park that we got married at! It was birthday party day, which meant we needed to head back down the hill to Sacramento for the big event. We made it to the party and celebrated all afternoon. In the early evening we headed back up to Truckee to spend one last night before we needed to head home. We started off the day by visiting and helping out at the Truckee Tahoe Relay For Life event and to catch up with more friends. It was really nice to see everyone that was still at the event. We went to Donner Lake Kitchen for breakfast and then we packed up to head North. We said our goodbyes to Lana Sue our gracious host and off we went! 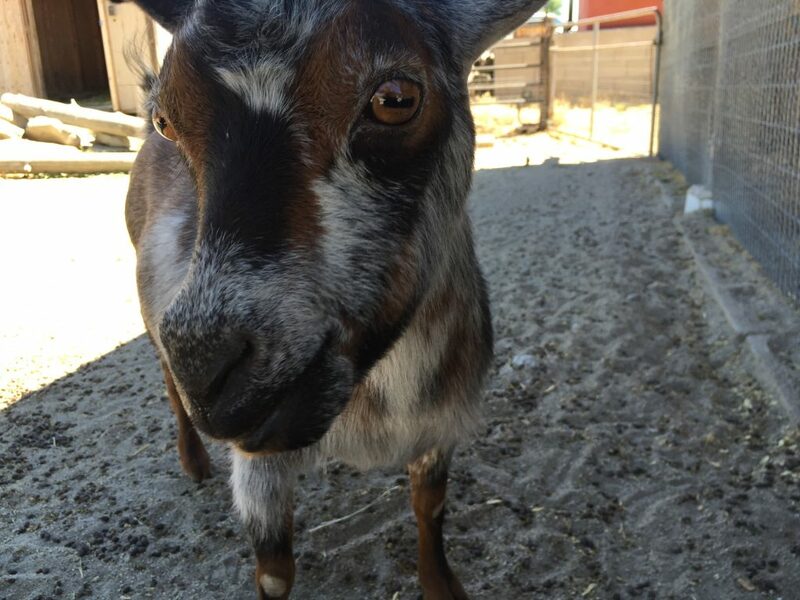 First stop was Sierraville, California at our favorite general store to feed our favorite goats. We were a little disappointed to find out Buddy the goat had moved to another home but we did get to visit with Bella. She is still just as feisty as she always has been. She didn’t really like the apples we had to feed her but the chickens sure did! We continued on highway 89 towards Lassen National Volcanic Park. It had been a hot day and it was really nice to enjoy some cooler weather. The views were spectacular and it is a site to see! Heading west we road in the hot hot hot weather. It was a grueling ride to head to Redding, California but we made it! We spent the night in a air conditioned hotel room that was just what the doctor ordered. I had to work for part of the day so we didn’t hit the road until after 3 and by that time it was 101 in Redding! We braved the heat and headed north on highway 5. We stopped in the town of Mt. Shasta, California for a break and then our next goal was getting to Oregon. We continued our way until we got to Medford, Oregon and stopped for dinner. If you have never had a meal at Black Bear Diner you must put it on your list! Black Bear Diner is good comfort food and if you are looking to fill your belly it’s definitely the place to go! We enjoyed a fantastic meal and got back on the bike and headed north. Our next stop and final stop of the day was Roseburg, Oregon. We stayed at Best Western there that had a jacuzzi bath tub! This big motorcycle trip had been hard on the body and having that bath tub in the room was just what we needed! We filled our bellies and the gas tank and headed back to the highway with our final destination Portland, Oregon! It was much more pleasant ride than the past two days. It was cooler, greener, and it felt like home. We took one break on the way home at a rest stop and it was delightful! I laid down on the picnic table and enjoyed the cool breeze and the shade from the trees. 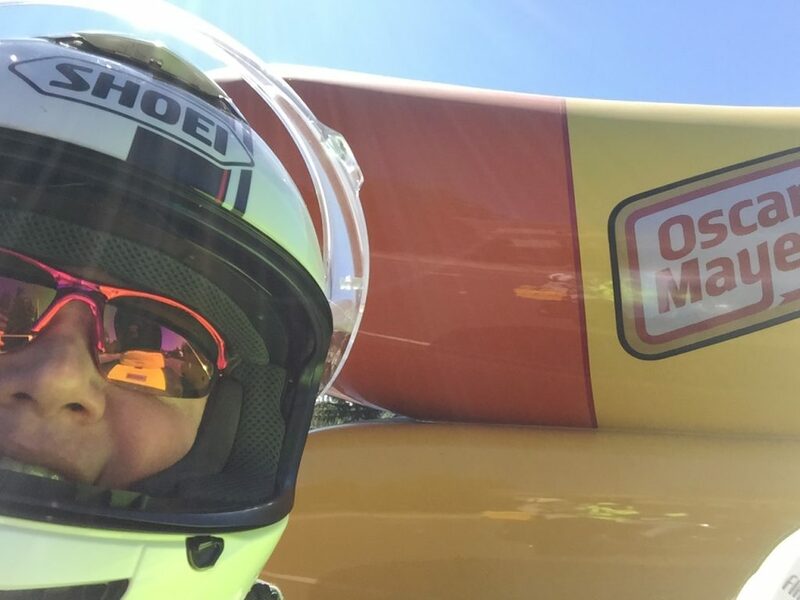 As we got closer to Portland we had a fun surprise happen on the highway, we saw the Oscar Meyer Weinermobile! 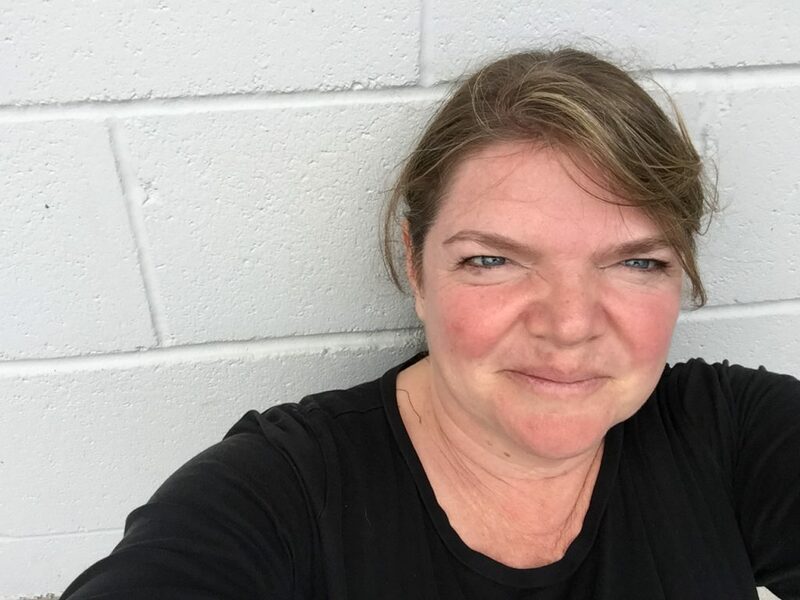 I got my phone and took a fantastic selfie! As we got closer to downtown it was great to see the buildings and the bridges. I took lots of pictures of this great city we call home! Finally, we got off the highway and rode into our neighborhood to find our home and puppies all waiting for us. We did it! 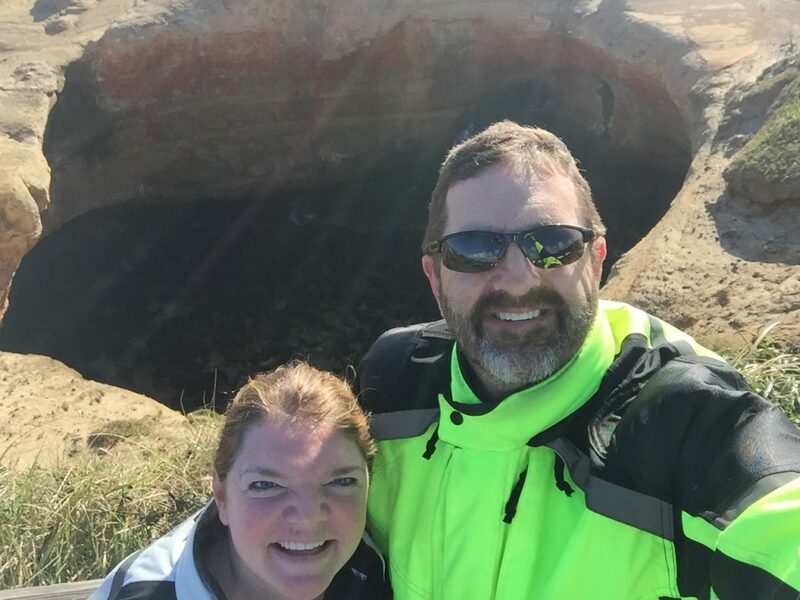 Our first big motorcycle trip together had come to a close and we made it back home all in one piece with an adventure we will always remember. What a trip! I survived my first big motorcycle trip and learned so much about how to travel on a motorcycle.